CRC recently received the great news that a new USAID project in Madagascar has been given the green light. 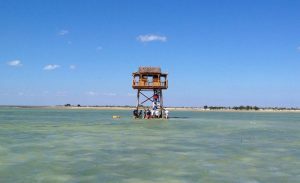 The project, titled Hay Tao (or “know-how” in Malagasy), will focus on natural resource management and involve several partners, including the World Resources Institute and Blue Ventures, with whom CRC currently collaborates in Madagascar on capacity development for managers of locally managed marine areas. Hay Tao’s lead is Pact, a nonprofit international development organization that works around the world to improve the lives of those challenged by poverty and marginalization. CRC will lead the efforts that focus on coastal communities and marine protected areas. 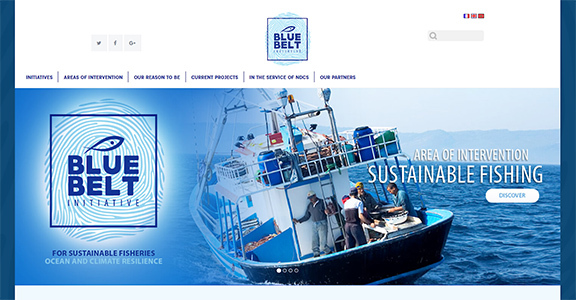 This project will draw on the Center’s more than two decades of similar experience in the Western Indian Ocean region. On its Independence Day, we celebrate our Ghanaian partners in their accomplishments over the last 61 years. We look forward to continue working with them on ongoing challenges for food security, such as developing a sustainable fishery and managing the Fall Armyworm infestation regionally. Faculty and staff at the Coastal Resources Center (CRC) welcomed 13 international graduate students to URI and Rhode Island last week with a potluck dinner social. These master’s- and Ph.D.-degree candidates hail from Eritrea, Ghana, Indonesia, and Malawi. They’ll be furthering their studies at URI’s College of Environmental and Life Sciences and Graduate School of Oceanography with financial support from USAID/Ghana’s Sustainable Fisheries Management Project (SFMP), USAID FISH Project in Malawi, and the University of Cape Coast, Ghana. Through CRC’s Ambassador Program, the students are receiving logistical support for living in New England, and have been adopted by a new family of friends and well-wishers. Heard about FORTIFIED homes in the Providence Journal or on RI Public Radio and how they can help your clients and communities be more resilient? You too can become FORTIFIED Wise. A training session on May 10 will provide participants with a solid understanding of the FORTIFIED Home building principles, construction practices and verification requirements. 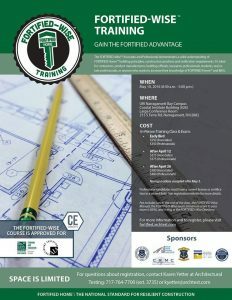 The FORTIFIED-Wise accreditation is ideal for anyone who wants to learn more about FORTIFIED Home and its sponsor, the non-profit Insurance Institute for Building and Home Safety (IBHS), whether they are new to the program or not,”including architects, engineers, builders, contractors, insurance professionals, product manufacturers, building officials, students and real estate professionals. The FORTIFIED-Wise course is approved for International Code Council Education Units (CEUs) and American Institute of Architects CES. Dr. Michael Oppenheimer, a longtime participant in the Intergovernmental Panel on Climate Change (IPCC), which won the Nobel Peace Prize in 2007, will share his insights on emerging climate science and trends at the next Beach SAMP stakeholder meeting, Tuesday, May 3, from 6 to 8 p.m. in Corless Auditorium on URI’s Narragansett Bay Campus. 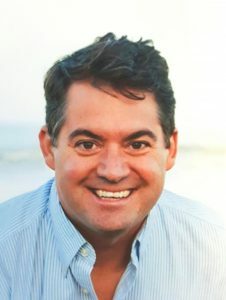 He recently served as a coordinating lead author of both the IPCC’s special report on extreme climate events and disasters (called SREX) and the Fifth Assessment Report. Dr. Oppenheimer has been a member of several panels of the National Academy of Sciences and is now a member of the National Academies’ Board on Energy and Environmental Studies. He is also a winner of the 2010 Heinz Award and a Fellow of the American Association for the Advancement of Science. 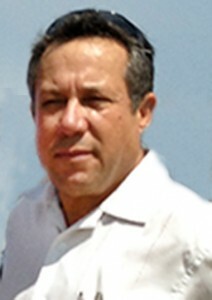 His interests include science and policy of the atmosphere, particularly climate change and its impacts. Much of his research aims to understand the potential for “dangerous” outcomes of increasing levels of greenhouse gases by exploring the effects of global warming on the ice sheets and sea level, on the risk from coastal storms and on patterns of human migration. Hundreds of people attended Friday’s public lecture by URI President David M. Dooley at the University of Cape Coast (UCC) in Ghana and later witnessed the signing of a memorandum of understanding between CRC/URI and UCC’s Department of Fisheries and Aquatic Sciences and Centre for Coastal Management, during the president’s first trip to the West African nation. During his talk, President Dooley said his vision upon assuming office as president of URI was to vastly increase internationalization and globalization of the school and its students because the world we live in is not just interconnected but interdependent and hyper-connected. Such hyper-connectedness includes a global economy and society in which citizens communicate in seconds and not in days or weeks. The complexity of the modern world includes great challenges, such as climate change, which is beyond one single nation’s ability to solve alone, he continued. President Dooley continued his inaugural trip to Ghana Saturday when he met with four doctoral and two master’s students bound for URI on a USAID-funded scholarship program. The graduate students went through an intensive and competitive selection process to emerge as recipients of the scholarships. President Dooley congratulated and welcomed the students in advance to URI and hoped they make the most of the experience. 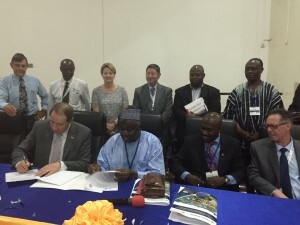 Two USAID projects, USAID/Ghana Sustainable Fisheries Management Project (SFMP) and USAID/UCC Capacity Strengthening Project are collaborating in this effort. Also Saturday, two research assistants from UCC supporting SFMP’s research and improved data quality systems activities demonstrated how they collect fish stock data. 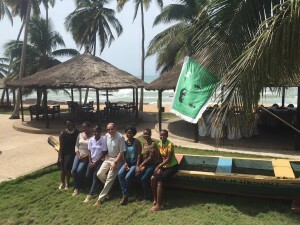 URI President Dr. David M. Dooley is in Ghana through April 20, solidifying relationships with Ghanaian universities and visiting projects led by CRC: USAID/Ghana Sustainable Fisheries Management Project (SFMP) and USAID/West Africa Analytical Support Services and Evaluations for Sustainable Systems (ASSESS). 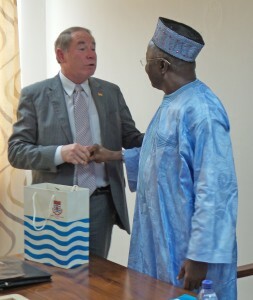 On Friday, April, 15, he met with University of Cape Coast (UCC) Vice-Chancellor Professor D.D. Kuupole. President Dooley said he sees his visit as an opportunity to strengthen collaboration and friendship with the wider university community. Prof. Kuupole says UCC treasures the collaboration, which has helped draw the university’s Department of Fisheries and Aquatic Sciences into the limelight.